From Mack Brown to Neal Brown, college football’s silly season of coaching moves is cranking up. On the latest AP Top 25 College Football Podcast , Andy Staples of Sports Illustrated joins AP’s Ralph Russo to discuss the comings and goings of coaches. 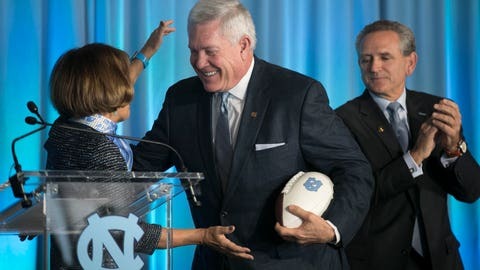 Mack Brown was a surprising hire at North Carolina. With Les Miles going to Kansas, that’s two 60-somethings getting back in the game. Staples questions both moves, when the trend has been toward hiring 30-somethings like Troy’s Neal Brown. Also, heading into championship weekend the College Football Playoff has come down to a few possibilities. Oklahoma holds an edge or Ohio State but the Southeastern Conference could bump out both the Sooners and Buckeyes. If that happens, could it lead to playoff expansion?